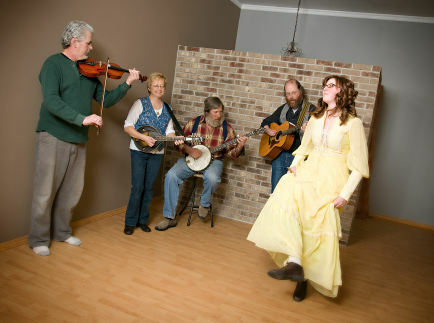 In 2005, I had a booth of Appalachian instruments at the 2nd Annual Celtic Festival in Moorhead, Minnesota. The doors opened at 10 AM, and at 10:10 AM a fellow came in and saw me playing in the old time banjo style. He mentioned to me that he had not seen anyone play in that style in almost 30 years. That person, Dave Holzer, hung out at the booth for almost two hours. We have been playing ever since. We met Deb Heier at a weekly jam, and she soon started playing with us on a regular basis. Micheal Miller plays fiddle with us every now and then, he is usally joined on the pennywhistle with his daughter Liz, but since they live almost a hundred miles west of us, it can be a big commute. I am also the caller for old time dances we perform. We get together at least once a week to play, and enjoy Carryin' On traditional Appalachian music to others. We do offer CDs for sale. Please visit the store link for more info. We are always eager to play for others. So feel free to pop me an email.